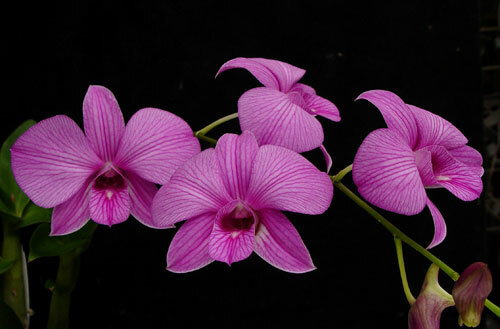 These are warm-growing dendrobiums which should perform well in household temperatures. Blooming season is spring through fall. The dendrobium phalaenopsis do well in an east window receiving direct sunlight until 11:00 or 11:30 a.m. and shade for the rest of the day. A south window is also suitable, but remember that the sun's intensity increases dramatically from March 1 to the beginning of October. A sheer curtain should be used then to filter this stronger light. The other problem with a south window is that in mid-summer the sun gets so high that it fails to reach the plant. One can place these plants outside in bright shade from June 1 to September 1, being watchful for frost. These plants are evergreen and do not require a rest period as some dendrobiums do. They should be watered as they approach dryness. This can vary from 2 to 5 days, depending on humidity, air movement and the amount of light they receive. When using tap or well water, these plant should be fertilized every two to three weeks in the summer and once every month in the winter. Use Grow More 20-10-20 for year-round growth and flowering. These are warm-growing dendrobiums, so they like nights of 60-65 degrees F. and days of 70-85 degrees F.
The bloom sprays appear from the top of the canes when mature and usually have from 5-20 flowers that last from one to three months. Some are scented. When the blooms are done, cut the sprays just where they meet the canes. Canes have the potential of producing several sprays from the upper leaf axils. Repotting should be done only as the mix breaks down (every 2 to 3 years) or as the plant outgrows the pot(when the canes start growing out over the edge of the pot). They can be divided when large, leaving three canes per division.